Convenience Stores carry a small selection of beverages, food and snack items. In the Crossroads of Lake Buena Vista shopping center - located across the street (SR 535) from the Downtown Disney resorts on Hotel Plaza Boulevard. This is probably one of the most popular selections for store-seekers. It's best to drive to Gooding's or take a cab, unless you're staying at one of the Hotel Plaza resorts closer to SR 535, such as the Best Western Lake Buena Vista or the Hotel Royal Plaza. But even then it's probably a good ways, especially when you're hauling groceries. Some form of transportation would be your best bet. Located off US 192 east of the Walt Disney World resort area. Hours: Monday – Sunday, 10 a.m. – 10 p.m.
Special Feature: Take Care Health Clinic on site. Open 7 days a week; including evenings, no appointment necessary. Treatment for patients 18 months and older. Most major insurance plans accepted. 11957 South Apopka Vineland Rd. Note - If you are traveling to Walt Disney World by plane and looking for transportation to and from the airport, check out Quicksilver Tours & Transportation for your transportation needs. Quicksilver will include a grocery store stop on your way to your resort, if you so desire. Grocery stops must be requested in advance. 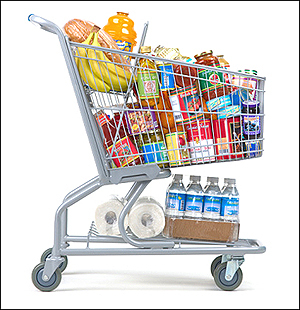 Get that grocery shopping done at the beginning of your trip and rest easy. If you won't have a rental car, you can use a Taxi Cab or Uber/Lyft to get to any of the above locations.